Farm management checklists don’t limit farmers – they free farmers. 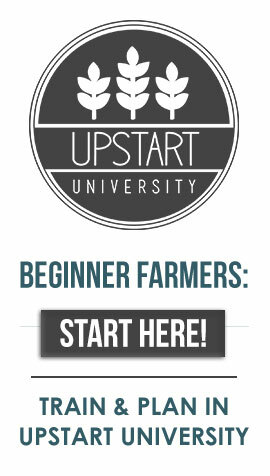 Starting a farm can feel like an overwhelming process to new farmers. Many new farmers are tempted to avoid farm management task lists, schedules, and other things that they feel constrain their freedom to manage a farm. After all, seemingly trivial tasks like recording data and monitoring the farm for pests that may or may not exist cuts into time that could be spent doing more urgent things. Nick Marasco, Upstart Farmer at Triple Threat Mentoring, thinks that a different attitude towards management will actually help the farmer. Building schedules and sticking to them is a habit that ultimately frees the farmer from having to wrestle with problems after they arise. After all, fluctuating maintenance and unstable management practices are the root problem of farm troubles like inconsistent yield, pest outbreaks, and staff confusion. Dealing with them before they occur puts control back into the hands of the farmer. “Start the scheduled maintenance things early; stay ahead of the curve; don’t let problems arise,” says Nick. As soon as you start using a system, events start taking place. Every event—disturbances and interactions—opens up opportunities for human error. Each disturbance or interaction with the plants and their environments has chain reactions, many of which can promote pest problems. Many pests reproduce rapidly. If a population of a pest like aphids goes unnoticed, it could mean a sudden boom in a farm. This not only means higher crop loss, but more money spent on controls and the labor to apply controls. Recording actions on the farm, like sprays and supplements, allows growers to reflect on the causes of problems that arise. For example, imagine that Farmer Ian enters the farm one day and notices that the leaves of his parsley are curled and tight. He sees no burning or chlorosis on the leaves, and no insects, mites, or fungal infections on the crops. The system appears to be functioning normally. Without an activity log, Ian is at a loss. If Ian has an activity log, however, he can open it up and see what each employee has done in the farm in the last few weeks. He sees that one of his employees did the seasonal cleaning of the system last week with a mild bleach solution. They rinsed the farm once. Farmer Ian, knowing that residual bleach can mess with plant function, has a possible cause. He looks it up and sure enough, bleach causes curling in parsley. He educates the employee, and bleach toxicity never happens again. Reviewing measurement data, activity logs, and production numbers on a regular basis allow farmers to step back and look at the big picture of farm function. When a farmer can see trends in management and production, he is enabled to make choices that improve both. He can see that certain management practices are more efficient than others, and how certain actions and inputs boost production. Now he can replicate those forces to operate a more efficient, productive farm. Without detailed water tests, treating nutrient deficiencies can be difficult to respond to in real-time. Creating supplementation schedules and tweaking them over time reduces the number of deficiencies that farms experience. Many of these regular practices reflect GAP principles that should be built into every farm’s operation. So just what should your maintenance schedule look like? We create a starter checklist to help you get on the right foot. This includes daily, weekly, monthly, and annual tasks of a properly operating farm. Have items to add to the list? Leave them in the comments below! Start creating good habits with this FREE checklist.